The gritty image of the scrappy 19th century newsboy, the can-do kid slinging newspapers from the street corner, full of vinegar and character, was an encouraging invention of the newspapers themselves. Children were cheap labor, willing to sling stacks of freshly printed papers to corners across the city. Many kids preferred the profession to that of bootblack or messenger boy, and it was certainly more profitable than peddling door to door. 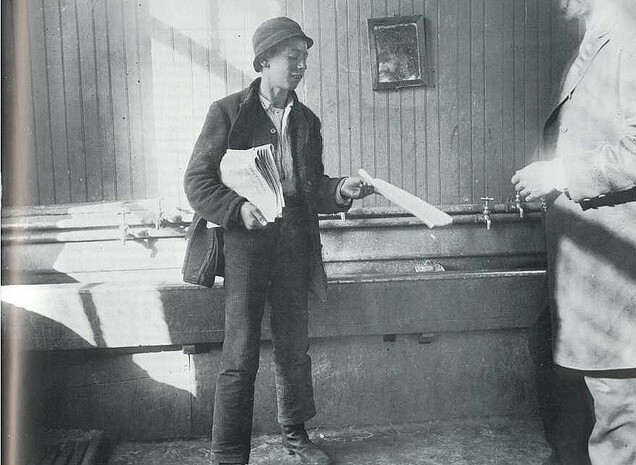 Newsies were frequently mentioned within general-interest stories of homeless, outcast whelps, considered almost blissfully, as though their own news delivery forces weren’t themselves part of that pathetic number. 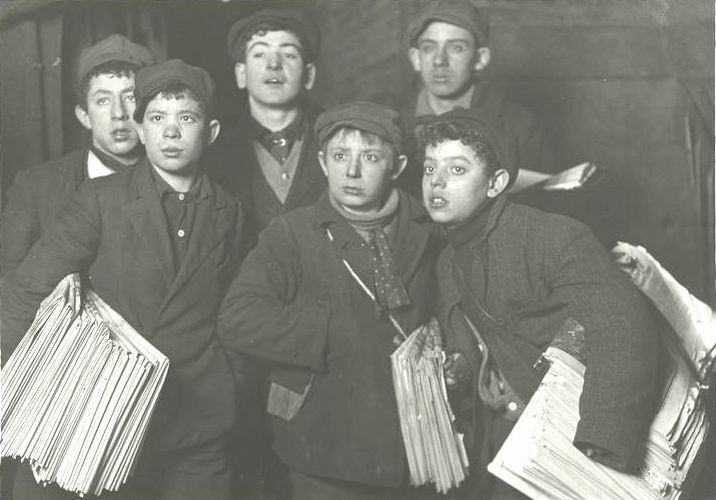 The papers stereotyped newsboys (who were occasionally girls, too) as orphans or ‘street arabs’ with purpose, self-sufficient little adults plucked by their profession from the grasp of destitution. Many children were homeless; the lucky ones took shelter in ‘newsboy lodging homes’, but many braved it in doorways and slept over gratings. 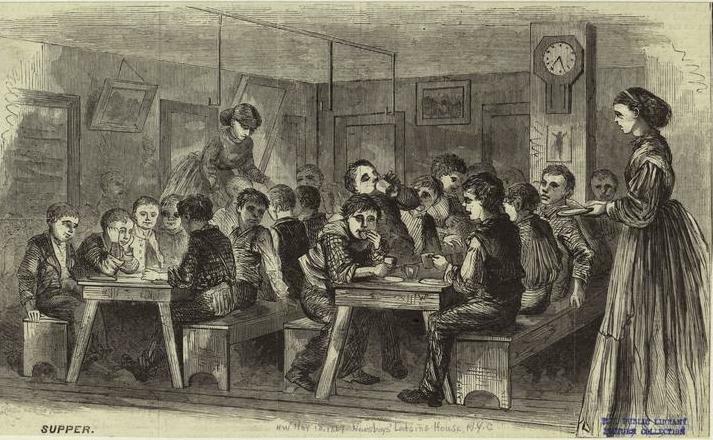 Some found this life preferable to New York’s houses of refuge, dreary orphanages that were often grouped with homeless shelters or other asylums. Those children who did have families took employment out of necessity or as a means of escape. It took organized action (culminating in the Newsboy Strike of 1899) and the work of child-labor activists like photographer Lewis Hine to highlight the unsavory conditions and low pay. No time was worse for a newsboy than winter. Not only was it physically difficult to sell newspapers in cold and snowy weather — or worse, the wet, wintry mix that often typifies the New York season — but children were rarely dressed for comfort. The idea of Christmas was a luxury. As newspapers were sometimes heavier due to increased page count, some children may have even dreaded the holiday. But the Gilded Age wealthy were charitable around the holiday, and a few lucky ‘urchins’ got a gracious Christmas handout. Some groups, like Charles Loring Brace‘s Childrens Aid Society, worked year-round to get children off the streets, via ‘orphan trains’ that sent children to live with families in other places. Those that remained in New York, the ones fortunate enough to find shelter at a newsboys lodging house like the one at 9 Duane Street, celebrated the holidays with an large annual feast hosted by importer William M. Fleiss. The wealthy trader brought annual Christmas meals to the needy children at the lodging house for almost thirty years. “The newsboys were not overlooked by Santa Claus, ” said the New York Times in 1893. At the 1897 dinner, the lodging house dining room was festooned with evergreen branches and white linens. Children ate in shifts, enjoying a bountiful feast that included ham, turkey, mashed potatoes and plenty of pie. A familiar face at some of these lodging dinners was a young police commissioner Theodore Roosevelt, his father being a co-founder of Brace’s aid society. There was plenty of room for shenanigans at this dinner. Another source confirms that “a few fine, soft pies were deposited down some unfortunate newsboy’s back between his shirt and him.” By most accounts, however, more food was eaten than thrown. Another group of newsboys in 1898 enjoyed a bountiful dinner of “oysters on the half shell, consomme julienne, radishes, celery, salmon, mayonnaise dressing, turkey and cranberry sauce” courtesy of early grocery giant Frank Tilford of Park & Tilfords, the Whole Foods of its day.